Nah, this was just the script I used in the first place to download all accuweather images. I forgot it was there, you can safely delete it. For all who are using Teo's scripts with the WeatherUnderground API, this is good to know: Effective 2018-12-31, the API will shut down. Source. Is it absolutely certain that the current WU script will stop working? It uses a master key that seems to work for everybody. Now that's interesting. I know I still have some of mrpeachy's wunderground LUA scripts that still work too. Look out January 1st we are coming for you! Hello everyone, I was wondering if it happens only to me. as if not said, everything works. If you mean the absence of images, it only happens when I power on my pc (or after a restart) because conky doesn't have the time to "see" them. After it updates itself for the first time the images are always there. Thanks @teo it happens when I start it, the connection is ok. It's a pity, but the reliability of the transmitted data of "my personal weather station" (pw) was excellent in the last three months and never better! ↑ Yea, I got the same same, unklar. ... so we will just have to convert everything to Accuweather. I have a question about executing the weather scripts in conky. I don't remember how log I have this issue, but I've managed to target it now, and it looks like the texeci is involved somehow. Basically when I start conky, everything works just fine for some time, but from time to time, my GUI session hangs/freezes for 10-30 seconds, and after that it works fine again. When the hang happens, the mouse and audio work fine, but keystrokes and video seem to be frozen like in a regular hang when you want to press the reset button, but I can switch to TTY via ctrl+alt+F1 (so keyboard works), and under TTY everything works fine. When I go back to GUI session, it's still frozen. So it looks like only X-server/window_manager/compositor_manager is hanged. When everything backs to normal, my GUI session gets some fast forward mode, so for example a movie speeds up for a few secs to display all the frames that weren't displayed during the freeze. I removed all the texeci from conky weather scripts, and moved the execution of the scripts to cron (in 30min interval). I haven't noticed any hangs since then. 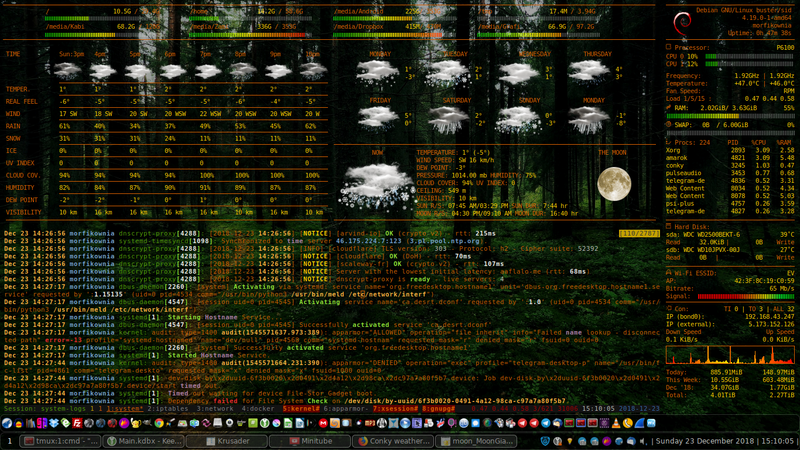 So what can be wrong with the execution of the weather scripts from conky? ^ answering that question will require complex troubleshooting. first of all, what conky config and accompanying shell script do you use? you'll need to show us. _your modified version_ of course. then troubleshooting: does the bad behaviour stop when you disable parts of the setup? like, let conky run, but just comment out the output parsing? or, does the freeze always occur when the cron job executes? in active development since 2013 iirc... i'm using it myself. Basically it's 4 different instances: 1 for disks, 1 regular conky, and 2 weather conky (hourly_2015 + images_2015 + moon). Have you tried merging the two calls to the script? Also, what is the -h_no_forecast parameter? I added the parameter to remove one part in the output, because it wasn't looking good in my conky. I could try to merge them and see whether that helps. That is a mighty conky you have there. Ok, next step: try merging the accuweather and the moon script to reduce the execi commands to just one. Also, you seem to have a spot of wallpaper in your conky. No, that won't work -- the hang happens even if there's only the left conky running, and it has only one script exec. That's strange indeed, I've yet to see any footprint whatsoever on my pc's performance running conky with the scripts, it's as though they aren't there. PS: Have you tried using execi instead of texeci? PS2: Merry Christmas and a Happy New Year!! !